I looked into Islam when the atrocities were being carried out by ISIS and was shocked by some of the things I discovered. This book answers a lot of questions on the subject. Why are Liberal governments in the west permitting such an anti western ideology to grow in the west? - who is really behind this? Western culture is the very opposite of what Islam is about? - what is the agenda? If you value western culture and it's democracy and freedoms (whatever your heritage) I urge you to educate yourself, friends and family on this subject . desperate, in face of all the evidence, to present Islam as a religion of Peace. The later, Medinan Koran is that of a man who was in charge, had established his own polity and was determined that his new religion should dominate the world, by force if necessary, whereby to purify humanity in time for Judgement Day. The beauty of this edition lies not only in the clarity of the chronological ordering of the Suras, which highlights the Medina and Mecca contrast. The introductory chapters are most illuminating. Only since the late 20th century have there been so many attempts by those in the non Muslim world to paint Islam as a religion of peace. 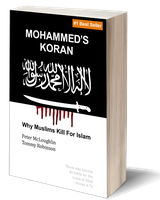 As with all works, written and spoken, that genuinely seek to enlighten the public who may be deceived by the glib nonsense of politicians, this book also makes clear that the majority of Muslims, who are indeed peaceful, are only that way inclined on account of their sketchy knowledge of the text that underpins their faith. it is succinct and not verbose. This is a very accessible book. You do not need to have had a middle-class education to understand it. The book moves along at a swift and smooth pace that keeps the reader engaged. It is also very well written. The shocking thing for me is how the book has so far exposed The Great Lie/Deception/Betrayal by the Western ruling-class and its allies in the controlled corporate media. They have systematically covered up what the Western ruling elite in the 18th, 19th and the first half of the 20th centuries were trying to warn us about - they knew that Islam was a backward, barbaric and savage desert religion of the middle ages that posed a threat to Europe. I highly recommend this book for anyone who seeks to understand the collapse of Western Civilisation - and how that collapse can be reversed before it is too late - by at least beginning to understand it's two main threats: Islam and the West's treasonous ruling-class. Nice to see the Koran laid out the way it should be read. Explains in great detail how Islam is known to be a great danger by western leaders yet they do their utmost to keep the truth from the general populace. I had 'certain' opinions (far right, fascist, racist etc) of Tommy Robinson before he turned author, mainly due to how mainstream media portrayed Tommy over the years. For those of you who still hold that opinion, I beg you to watch the video of Tommy Robinson speaking at the Oxford Union. You will finally begin to see the real Tommy Robinson and understand what has driven him to become 'Enemy of the State'. It's actually mind blowing and well worth the time I PROMISE YOU! If people learn what is in that book, Islam will be finished. I am going to re read as there is so much information to absorb. without skipping detail or useful information. The text is based on the well respected Pickthall translation of the Koran. By cleverly resetting it in REVERSE chronological order the reader can appreciate which early (and mainly peaceful) verses are cancelled by later (usually warlike) ones. This is inspired. Well done Tommy this is exactly what we need. What it doesn't explain is why political leaders & the police lack the will to tackle this demonstrably lethal problem head-on, preferring to focus their energies on tweets that may hurt some people's feelings instead. The first hundred or so pages detail how historically, western governments had understood the danger of Islam, and it's focus on spreading the religion through infiltration and war. It describes how this was well known throughout the civil service and the highest levels of government. This is illustrated by numerous quotes and policy decisions from the first half of the 20'th century. However this understanding was either forgotten, or deliberately ignored by our governments in the past 40 years. It also eludes to how Islamic countries are kept weak because the religion sets Muslim against Muslim over minor transgressions of the complex rules within Islam, and forbids critical thought so the contradictions in the Koran will not be questioned, this enables the religion to survive. This is achieved through death to apostates, un-believers who criticize the religion, and Muslims who ask questions. This avoidance of critical thought also discourages science and innovation which undermine Islam, and has led to poor development in Islamic countries. The rest of the book contains a copy of the Koran. A regular Koran contains the "revelations" that Muhammad supposedly got through the angel Gabriel, with the order all jumbled up. This Koran sorts those revelations in order from last to first... this is because later (often violent) revelations cancel (abrogate) out earlier (peaceful) revelations. The book also highlights the more concerning revelations in Bold so that they are easy to find. This does two things, firstly it makes it clear that there are a lot of revelations that will directly concern non-Muslims, since these revelations direct Muslims to kill or subdue non-Muslims. Secondly the concerning revelations are mostly towards the end of Muhammad's life, it seems in his last days and weeks he was very busy killing non-Muslims, and these later revelations override the earlier revelations. For people not familiar with the Koran, you will find that many of the revelations make little to no sense. For example a revelation might be "pick that up, and make good use of it"... you then have to read the Hadiths to find out that Muhammad picked up a sword and kill infidels with it (NOTE: The Hadiths provide "context" to the revelations, and were written by his followers who observed what he was doing when he received each revelation from Allah). So when you read the Koran section, do not expect a "good read", because the "revelations" do not have the "context" of the Hadiths. However many revelations are clear within themselves, and it is clear infidels are to be killed or forced to submit to Islam by Muhammad, who is considered the perfect example of conduct. Hence we see ISIS copying Muhammad in his killing-sprees, rapes, stoning, child-marriage, slavery... and all manner of other unpleasant things that Muhammad got up to. If you are going to buy a Koran, I'd buy this one... and use it as a talking point with family and friends. We should all be concerned about anyone who believes that this is the perfect and unalterable word of god (and many really do, which is idealogically why they segregate). In these conversations it is worth pointing out that one of the major issues with Islam appears to be that Muhammad had a peaceful phase when he was in a minority, and then a violent "death to unbelievers" phase when in a majority. This means that in countries where Muslims are a minority they can copy Muhammad and behave peacefully. But if they reach a majority, history suggests that they may feel compelled to follow the instructions from Allah and turn to violence.